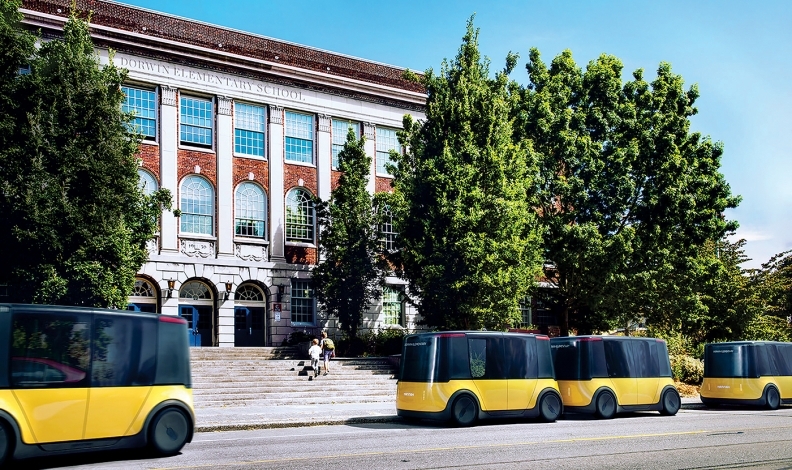 Communities hoping to use self-driving school buses, such as these shown in a rendering by Seattle design consultancy Teague, face technical and regulatory challenges. 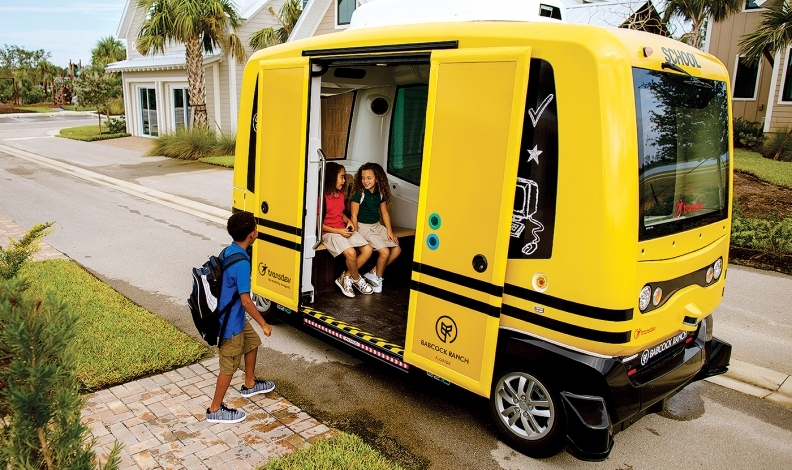 Children may someday ride in self-driving school buses, but — as a Florida community learned the hard way — that mode of transportation is not yet ready. Federal safety regulators last month demanded that the community stop carrying students on an autonomous shuttle designed to look like a school bus. A cease-and-desist letter sent by NHTSA officials said using the vehicle for that purpose "puts the safety of children and others at risk." It may have been a lofty goal to put schoolchildren on self-driving buses. Despite being the largest public vehicle fleet in the U.S., with 480,000 buses transporting children to and from school each day, according to the National Association for Pupil Transportation, school buses have received relatively few of the technological advances found in many other vehicles. The iconic yellow buses of today closely resemble those of the 1970s. They don't have seat belts, many don't have air conditioning and the vast majority run on diesel fuel. "There are different regulations for school buses," said Dirk Brassat, vice president of engineering for Faurecia. The fleets are expensive to maintain and upgrade, and regulations keep a tight lid on how experimental school bus makers can be, he said. "So progress will be slower." A rendering of a self-driving school bus unveiled in Seattle. Still, school buses are the safest form of ground transportation in the U.S., according to NHTSA. Bus accidents account for four to six child deaths a year, NHTSA said, and students who take the bus are 70 times more likely to arrive safely than those who arrive by car. It would be simple to write off the Florida episode as a cautionary tale of an over-exuberant community that got ahead of itself. But the situation was more complex, and it is a reminder of the intricacies — technical, regulatory and otherwise — involved in deploying autonomous vehicles, even for test purposes. Babcock Ranch leaders and Transdev, their transportation partner, had received permission from NHTSA to import the two EasyMile EZ10 shuttles in March. At that time, Transdev had sketched plans to use the shuttles to provide service around its private community to riders of all ages. A human safety operator would be aboard at all times. "We designed this pilot to further enhance our learning about what types of services would be most appreciated by residents, so that as the Babcock community grows, we can deliver a robust suite of mobility options," said Mitun Seguin, vice president of marketing and communications with Transdev, a global provider of public and private transportation. That's a goal that falls in line with Babcock Ranch's intent to provide a tech-savvy and environmentally friendly space for its residents. The company says the community has "the largest solar-plus-storage system" operating in the United States, and makes fiber-optic connectivity standard in all its homes. But Transdev failed to tell officials it planned to use a shuttle as a school bus, according to NHTSA. School buses fall under the purview of additional federal motor vehicle safety standards beyond the shuttle itself. "Had Transdev disclosed that the vehicle was intended to be used in school transportation, NHTSA would have considered a variety of additional factors in its evaluation … and whether additional conditions were necessary to ensure the safety of children," agency officials wrote in their letter. A pilot program in Florida that was halted after five weeks. Others see big potential for self-driving school buses. 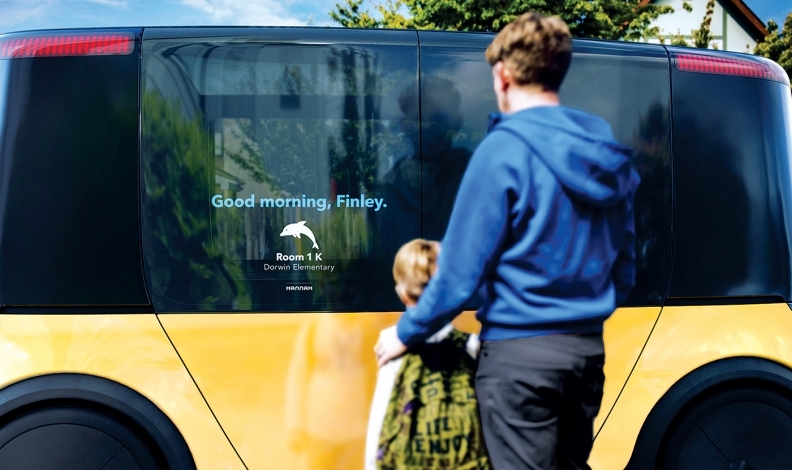 Last year, Teague, a design consultancy in Seattle, showed off its concept for a six-student school bus shuttle called Hannah, which showed how smaller vehicles could reduce transportation time for children. And, Teague said, the students could be safer because they would be dropped off at home rather than at a bus stop, reducing the risk of crossing streets. As for the children in Babcock Ranch, they're disappointed. A spokeswoman for the organization that runs Babcock Ranch said they "have enjoyed being 'pioneers' of this new technology." But until federal authorities deem them suitable test subjects for self-driving technology, they're back to riding their bikes to school.